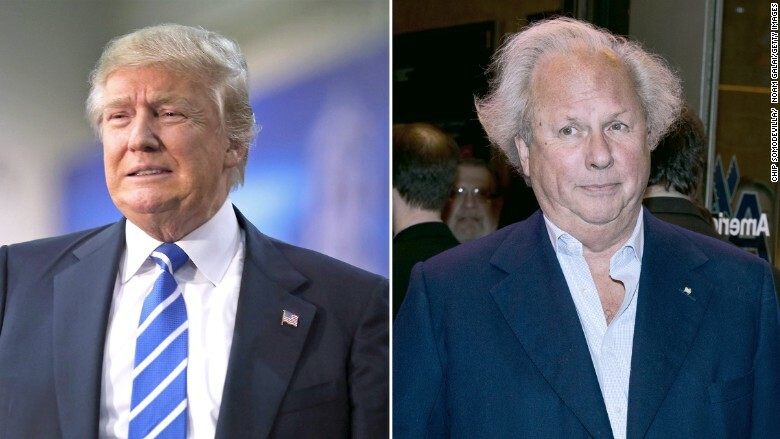 Donald Trump is a "mad jumble of a man," unlikely to win the presidency, but sure to leave a "permanent orange stain" on politics, his nemesis Graydon Carter says. Carter, the editor of Vanity Fair, used his column in the November issue of the magazine to sum up what he called Trump's "carny act." In the column, Carter reprised his decades-long insult of Trump -- that the man has small fingers -- and reflected on what a Trump loss might mean. Trump "lives off crowd approval. And at a certain point that will dim, as it always does to people like him, and the cameras will turn to some other American novelty," Carter wrote. "When that attention wanes, he will be left with his press clippings, his dyed hair, his fake tan, and those tiny, tiny fingers." Carter predicts that Trump will lash out now that his "flaws and failures" have been "exposed to the world." Carter normally tackles several subjects in his monthly editor's letter, but he decided to dedicate the whole thing to Trump this time. It was published online Tuesday. The feud between the two New York City celebrities dates back more than 25 years, to the days when Trump was a brash real estate mogul on the rise and Carter was co-editing Spy, the legendary satirical magazine he founded with Kurt Andersen. Carter is credited with coining the phrase "short-fingered vulgarian" to describe Trump in 1988. And Trump has never forgotten it. Before running for president, Trump blasted Carter with tweets claiming that Vanity Fair was in bad shape and that Carter's West Village restaurant, the Waverly Inn, served poor food. Carter, in turn, needled Trump in an editor's letter last November and put one of Trump's mean tweets about the magazine on the cover of the May issue. Carter's most recent letter calls Trump's campaign "ramshackle," references the businessman's "confection of hair" and questions why Trump's supporters don't see it the same way. "Through word or action, Trump has promoted gun violence, bigotry, ignorance, intolerance, lying, and just about everything else that can be wrong with a society. And yet he marches on, playing to a constituency that just doesn't seem to care," Carter wrote.